Teach short vowels in a snap with clever auditory associations. Being able to produce and segment short and long vowel phonemes is a decoding prerequisite. The five short vowels are the most commonly used phonemes, yet the most challenging to learn. However, students easily learn them when they are taught in isolation with auditory associations. Reading Manipulatives short vowel posters help students to remember and differentiate among the short vowel phonemes. Long vowels, which say their names, are easier to produce and identify. Since these memorable posters can be invaluable resources to students and teachers, we are making them available for free to those who visit our site. 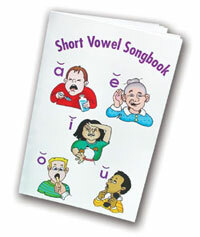 Try them and you will be amazed at how quickly your students learn the short vowel phonemes. The color backgrounds have been removed from the PDFs to conserve ink when printing. You can purchase the non-laminated Reading Manipulatives Short Vowel Posters & CD for only $16. Place sheet one on the top, front side up, followed by sheets two and three. Fold all three sheets in half (short a illustration and words are the center pages). Stitch down the center on a sewing machine or staple with a long-arm stapler.